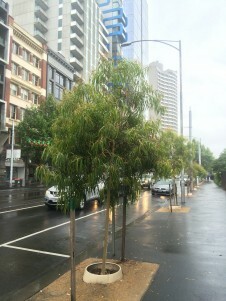 As part of the Urban Forest Strategy, Flinders Street was identified as an opportunity for streetscape redesign and replacement of trees. 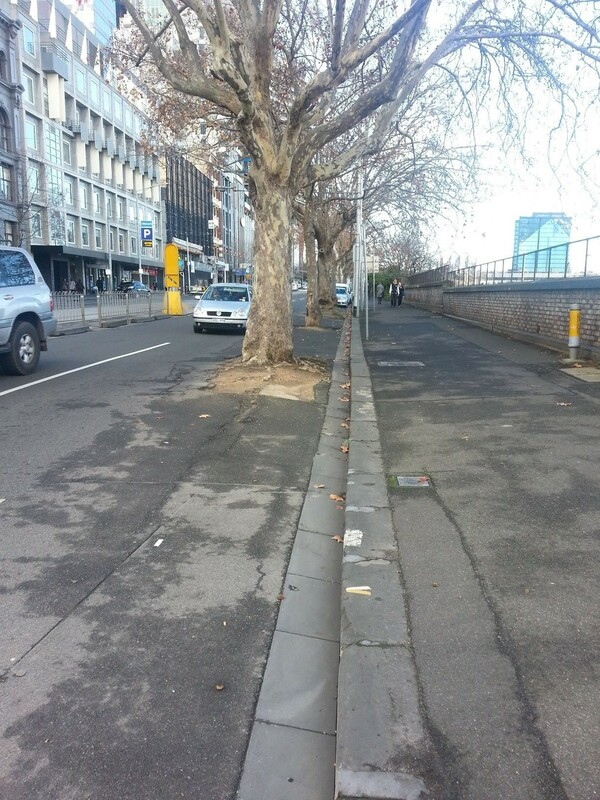 Between Exhibition and Russell Streets several London Plane trees were in poor health as a result of damage from vehicles and needed to be replaced. To minimise the potential for vehicle damage and allow trees to be planted closer together council took this opportunity to redesign the street. 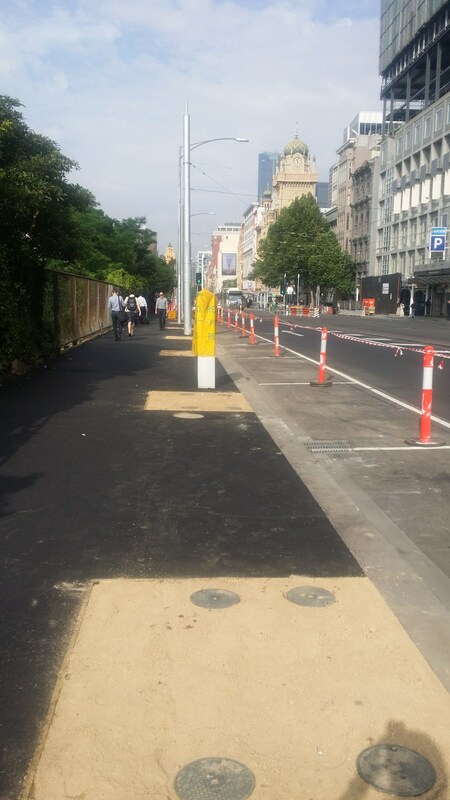 The footpath was widened so that new trees could be planted behind a renewed kerb and channel designed to allow collected stormwater to passively irrigate the trees. 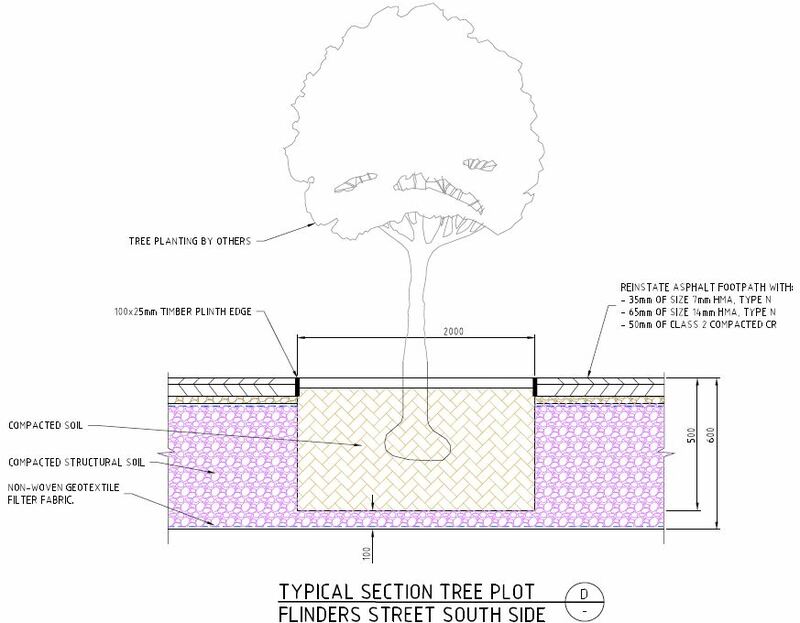 The new streetscape includes soaker pits that capture and drain water into an infiltration trench providing water for the trees. What benefits has the passive irrigation provided? Soaker pits capture water runoff from the road, irrigating the tree, cleaning the water and reducing stormwater runoff volumes. 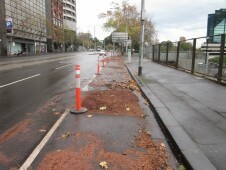 The soaker pits direct water to the subsoil to provide water for the trees along Flinders Street. When it rains, stormwater runs off roads and roofs into the gutters. The soaker pits act like normal pits and intercept the flow as it travels downhill along the gutter. Unlike normal pits the outlet of the soaker pits is via permeable pavers to an infiltration trench. The permeable pavers act as a gross pollutant trap, capturing litter and other pollutants, preventing polluted stormwater from entering the infiltration trench. The filtered water then travels through a slotted pipe that runs along the bottom of the infiltration trench. Irrigation to the trees is provided via the slotted pipe and structural soil trench. The soaker pit is best used in streets where there is limited natural water recharge and trees do not have access to water. A trench of structural soil connects tree plots allowing water to flow through the infiltration trench and provide water for the root balls of the trees. The slotted pvc pipe also directs water to areas of the infiltration trench with no direct kerb inlet. The Flinders Street Tree Soaker Pits were part of broader streetscape redevelopment that cost a total of $500,000. 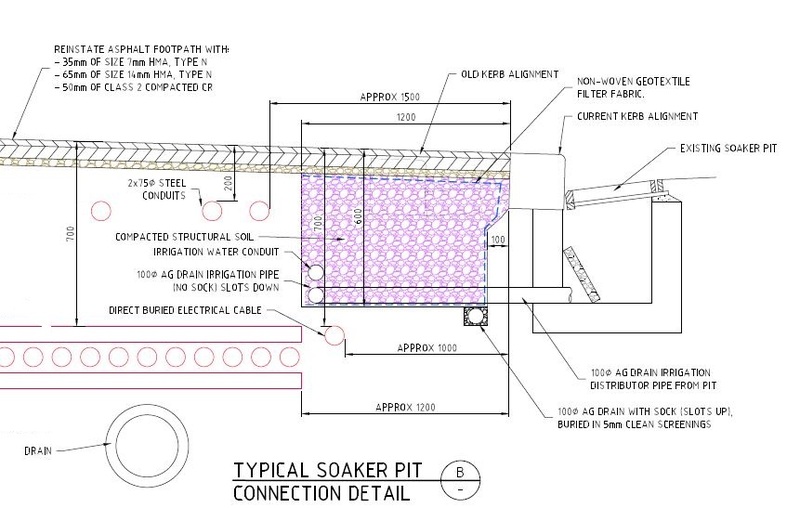 Soaker pits cost $2000 each and $1800 to install. 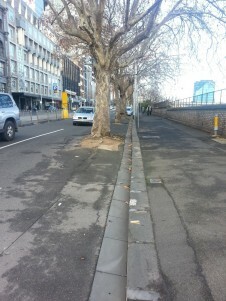 A traffic and parking study was carried out to determine the impacts of widening the footpath and planting trees back behind the kerb on traffic in and around Flinders Street. Concept designs were developed in consultation with Yarra Trams to allow for the best scenario outcome for all the competing uses, including pedestrian flow, car parking, public transport, traffic, amenity, canopy cover for cooling and shading, and urban ecology and biodiversity. Yarra Trams consulted broadly on the tram and traffic works. We then consulted nearby businesses about the tree replacements and footpath widening. Replanting the trees into the widened footpath not only helps protect the trees from vehicle damage but also provides shade across the footpath and carriageway without blocking access and visibility. Several soaker pits are built into the kerb to allow water to reach the infiltration trench and tree plots. Stormwater runs into the pit through a grated lid and permeable paver filter before entering a pipe that directs water to the infiltration trench. This prevents litter and other gross pollutants from entering the drainage pipe. The water then flows through a drainage pipe infiltrating the trench and tree plots with water. An infiltration trench was built along the southern side of Flinders Street, beneath the footpath. Water runoff is directed into the trenches, providing water for the tree root system. Stormwater flows into the soaker pit and through an irrigation drain that runs along the length of the structural soil trench. Purpose: Provides aeration, retains water, is suitable for tree growth and can withstand traffic loads while maintaining structural integrity. Composition: 20-40mm aggregate coated with soil to specification. 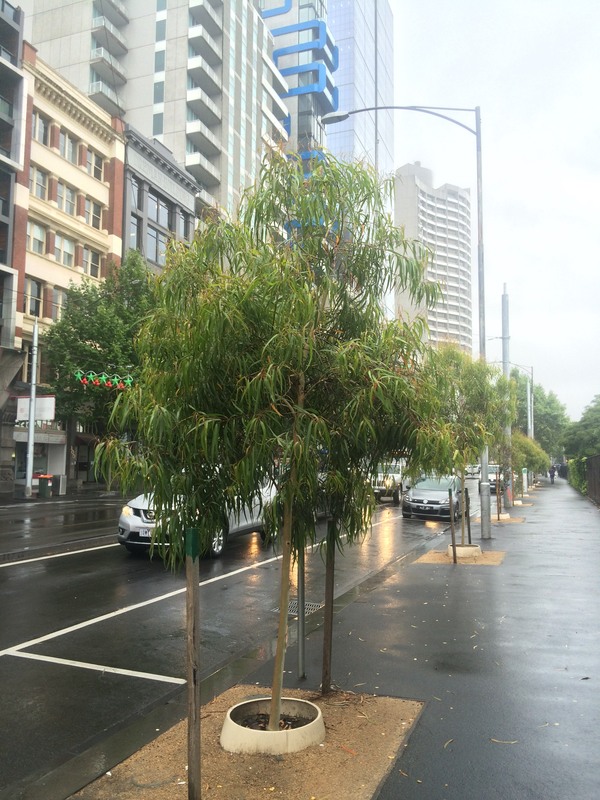 Species: Corymbia citriodora – lemon scented gum We planted 17 lemon scented gums as they grow well in open spaces. The tree plots were built into the irrigation trench. The tree plot is filled with compacted soil to a depth of 400mm and covered by 50mm of granitic sand. Below the tree plot is 200mm of structural soil allowing room for the drainage pipe which provides water for the tree root system. An automated irrigation service is installed to each tree plot providing a secondary source of water for the trees. Permeable paver filter clogged relatively quickly requiring pressure wash cleaning. An alternative may be a 5mm mesh filter in the pit with a secondary sediment and fine mesh filter between the pit and the infiltration trench. All systems will require sediment management and regular cleaning. Structural soils are significantly cheaper than using structural cells with a loamy sand soil, the latter is preferred by the tree planners. Structural soils are preferable to planting into ‘normal soil’. Incorporating water inflow monitoring would provide useful data for future projects to build a business case for these sorts of interventions. The success of this project together with lessons gathered from it has meant that the specifications for this work are now used for similar projects across the city.